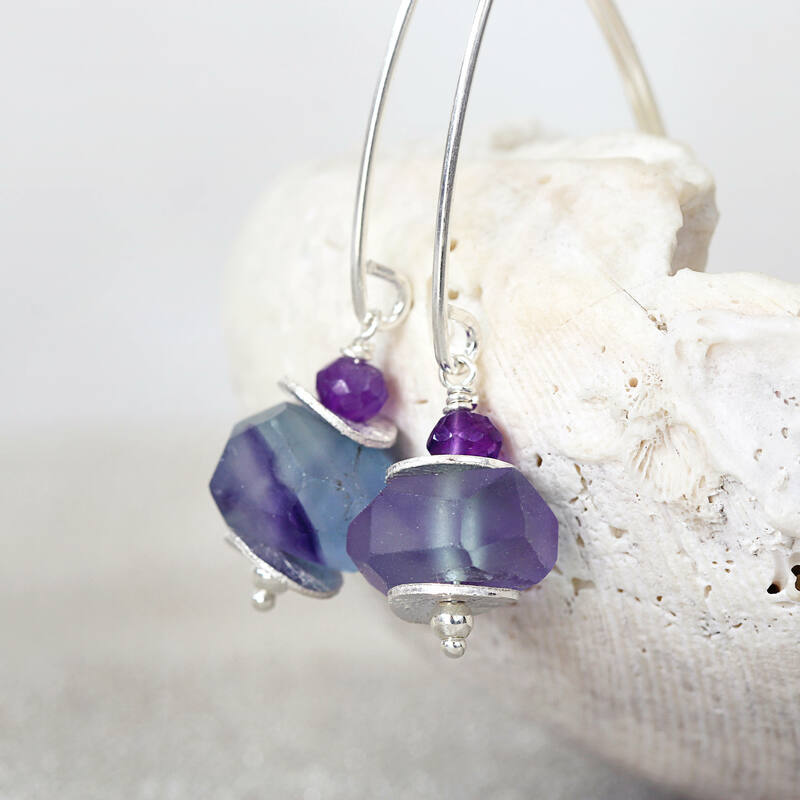 Featuring purple amethyst gems sat above rough, faceted, fluorite stones, with silvery glints and accents in-between. Hung from modern, stylish sterling silver ear wires. 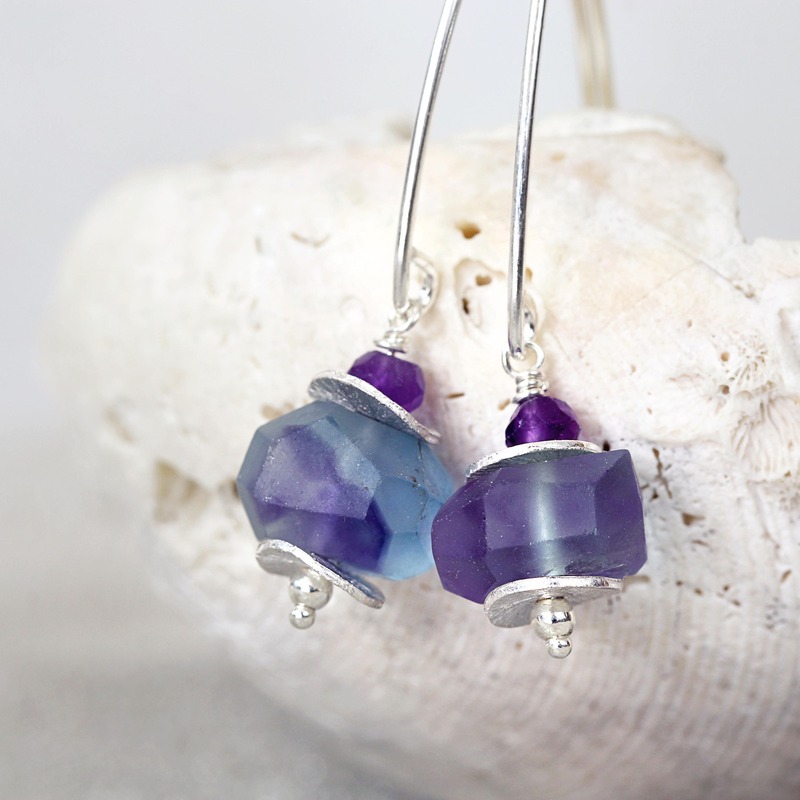 These lovely fluorite stones have a matt finish, and remind me of sea glass - some of the stones are especially beautiful when the light shines through. There are two colour options available - purple-blue (shown in pics 1,2,3,4), or green-teal (shown in pic 5). 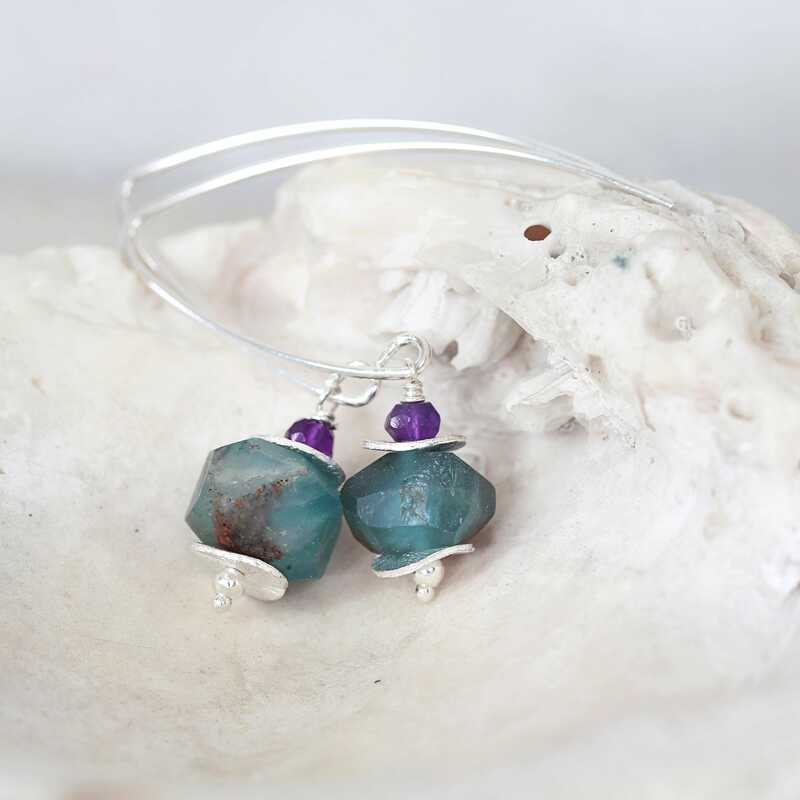 The name Fluorite comes from the Latin word for flux, i.e. a substance that promotes flowing and combining of other materials. Fluorite itself is often used as a flux in making steel which requires the removal of impurities. And so it is said that fluorite is great for cleansing, purifying, stabilising, balancing and re-organising on all levels, and can be ideal for wearing or having in the home and workplace. Also said to enhance focus and concentration, and to clear confusion and stress, so is an ideal crystal for work, study and meditation, as well as for bringing harmony and healing to the home. The colours can be vibrant and uplifting or soft and soothing. In addition, Blue fluorite, especially, brings a sense of calm, orderliness and peace, Green fluorite is especially healing and cleansing, and Purple fluorite brings intuition, spirituality and transformation. 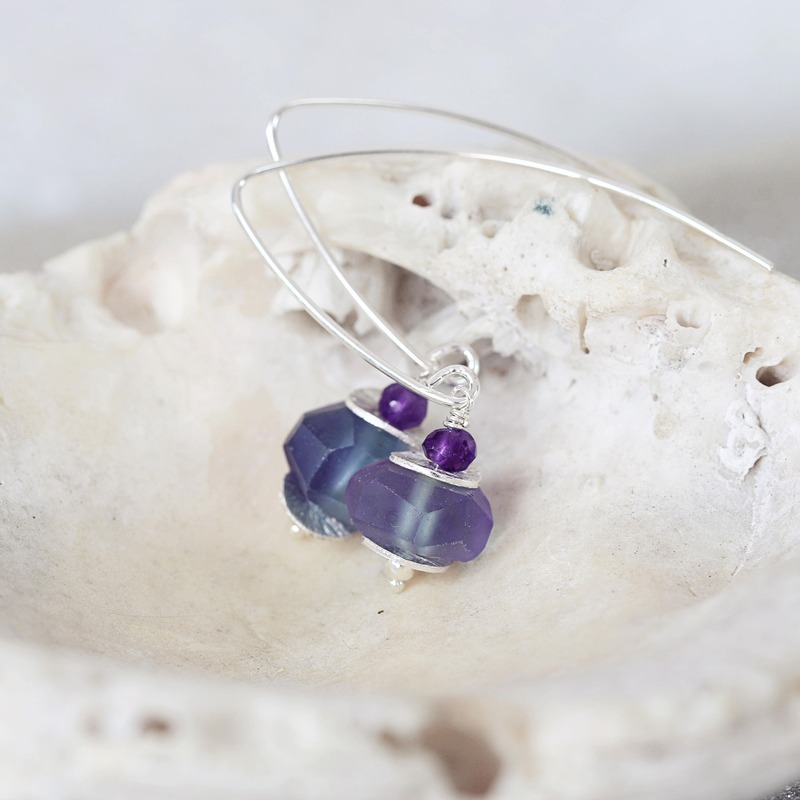 This natural fluorite pendant makes a thoughtful gift for a loved one - for mom, sister, friend, wife or girlfriend - for any occasion such as a birthday, a graduation, an anniversary, Valentine's or Christmas gift, or just for someone who would benefit from the special qualities that this beautiful stone has to offer. Two styles of matching necklaces are also available - please see links furher below. * Total length from top of ear hook approx 35 - 40mm. 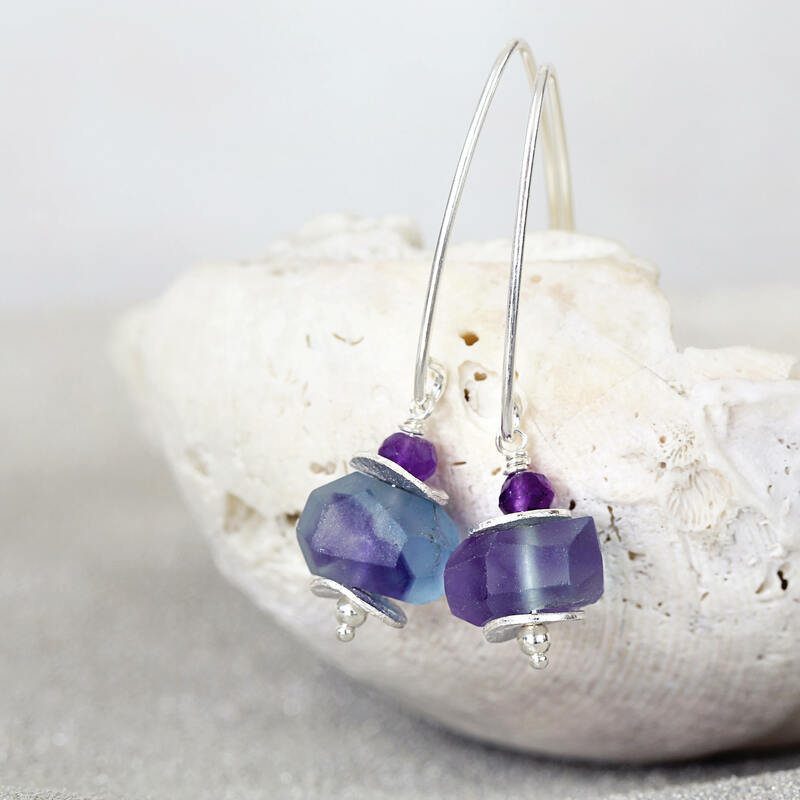 Fabulous colour on these lovely earrings!